First up were Mutoid Man, but unfortunately, whether due to poor venue management or some other extraneous circumstances, a large number of crowd members, including yours truly, are left queuing round the venue as the band play. It is a cold night in Leeds, as already mentioned above, so perhaps a slightly old start could be forgiven. 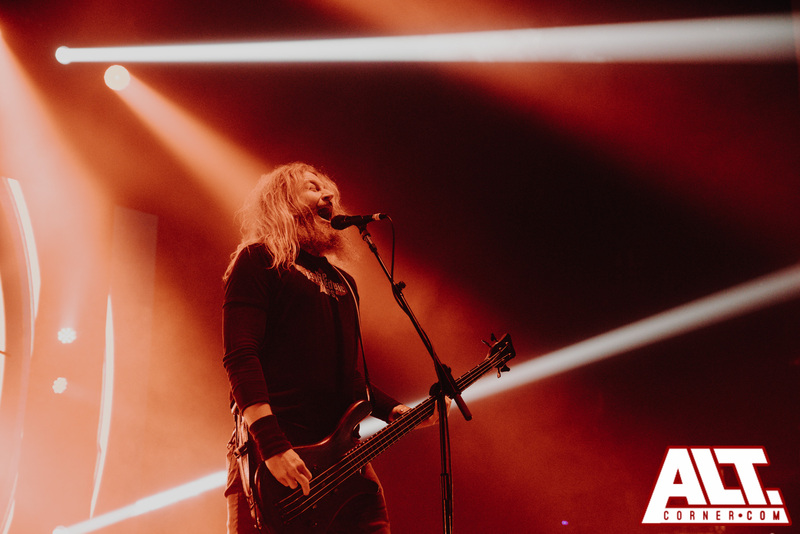 Mastodon come out swinging with older heavier cuts Iron Tusk and March Of The Fire Ants, but is not until they kick into Steambreather, from most recent release Emperor Of Sand, that things really click. This kicks off a magnificent run of songs taking in everything from the latest EP Cold Dark Place, to classic album Leviathan. The band are incredibly tight, especially the magnificient rhythm section of Brann Daillor and Troy Sanders, who may well be telepathic based on tonight’s evidence. The songs swing on their monolithic grooves when necessary, but with expert precision exercised in order to navigate the labyrinthine progressive sections. The band are clearly enjoying themselves on stage, with multiple references and jokes made about their first appearance in Leeds, on a morning slot at the legendary Leeds festival. The crowning moment of the set arrives in the form of frequent collaborator and Neurosis front man Scott Kelly, who joins the band for a run through of several of the songs he’s added vocals too, including Scorpion Breath, Aqua Dementia and most notably, an absolutely stunning rendition of Crack The Skye. They close, as is tradition now, on Blood and Thunder and it is a wonderful end to a brilliant set. This is a band on absolutely top form who show absolutely no signs of letting up after nearly two decades.